Discover Costa Rica's rainforest from a bird's eyes view! Located in Arenal's primary rainforest, at the base of the Arenal Volcano (near La Fortuna), the Ecoglide Arenal Canopy Tour and Park combines 13 exciting ziplines, gentle trails and a exciting Tarzan swing, promising you a dose of nature, adventure, adrenaline and amazing sceneries, all in a safe, eco-friendly (and family-friendly) setting! Don't miss this unique experience! 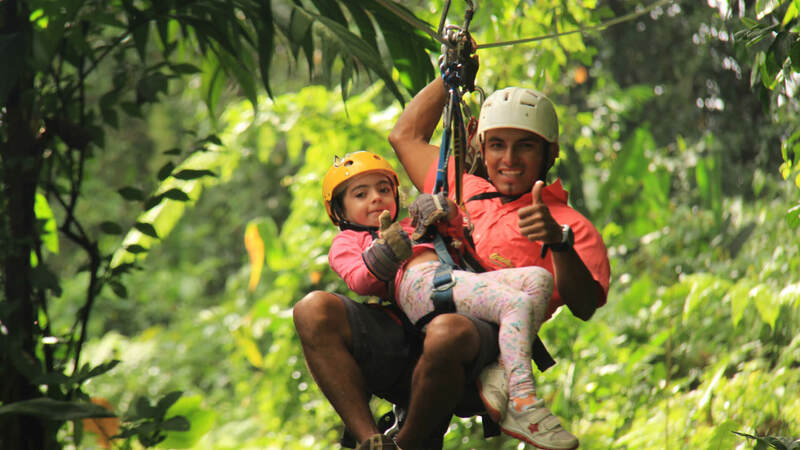 The zipline tour includes free transport from most hotels in the La Fortuna area. Pick-up in remote areas of Arenal and other parts of Costa Rica is also possible at an extra cost! Just asks us. (Note: It is advisable to spend at least one night in La Fortuna/Volcano Arenal area). Bear in mind that pick-up time from La Fortuna hotels vary, and are approximately 15 to 45 minutes prior to the tours start time. Will not be admitted the following people: Children under 2 years, Pregnant Women, Anyone with heart problems or who has recently been through surgery. 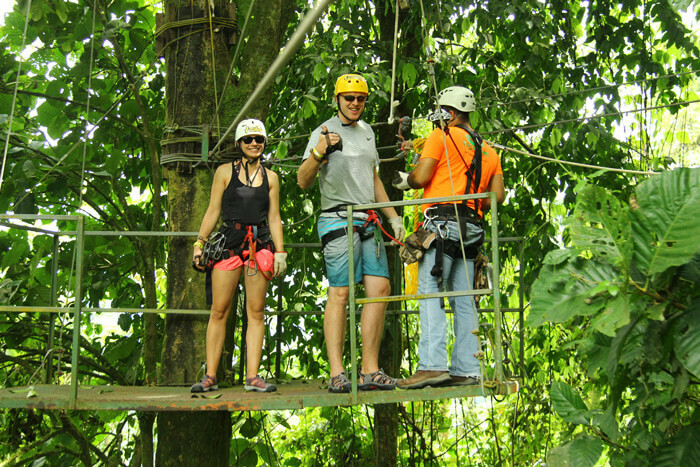 The Arenal Ecoglide Canopy Tour is one of the most exciting activities you will find that is readily available to the entire family. 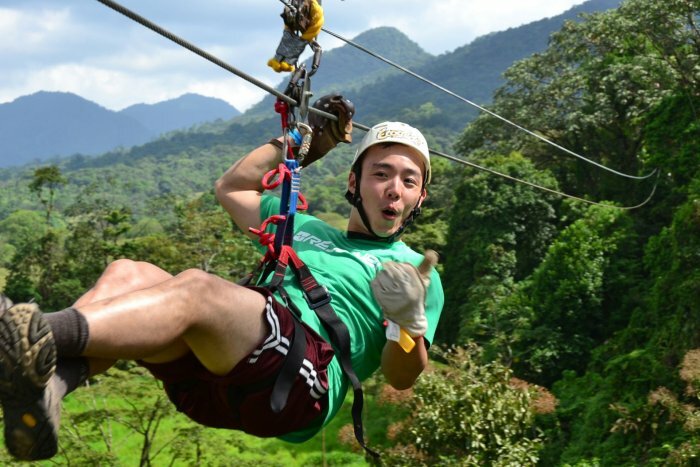 This zipline tour includes 13 zipline cables and one Tarzan swing reaching up to 38m high! The 13 cables are connected by platforms located in the canopy, providing closeness with the rainforest's lush flora, and perhaps a glimpse of certain birds and animals. As it is often the case with Canopy Tours around the world, the first cable is shorter and slower, giving you a chance to practice. The longest zipline cable is almost a half-kilometer long and offers incredible views of the forest and the nearby Arenal Volcano. 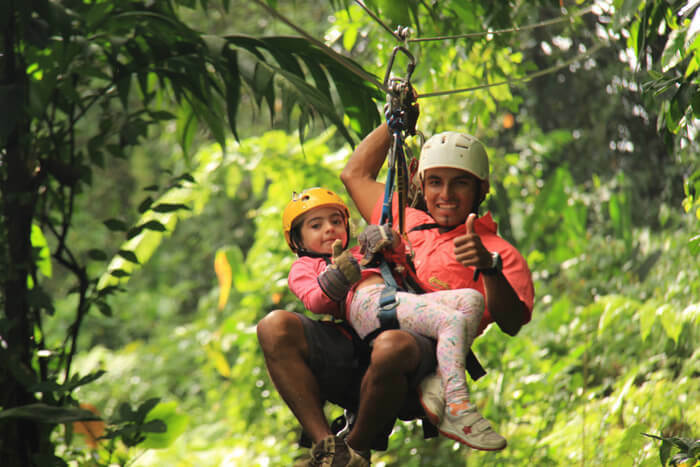 The Ecoglide's ziplines consist of a series of double cables and double pulleys system, meeting the safety standards set forth by the Costa Rican Tourism Institute and the National Insurance Institute. The guides are experienced and follow all safety measures. You will receive a safety information session at the Ecoglide Canopy Tour operation center. Note that children (weight permitting) can also "glide" tandem with a guide. PICK-UP TIME: Transport from your hotel is 15-45 mins from the tour start time - and will be reconfirmed the day prior. ECOGLIDE Canopy Tour 2018 Prices includes local transportation from most hotels in the area.